ASDIP STEEL is a structural engineering software for design of steel members and components. ASDIP STEEL includes the design of base plates and anchor rods based on the latest AISC / ACI 318 provisions. The design of anchor rods may become cumbersome and time-consuming, since it involves checking multiple failure modes in tension and shear, and then the interaction of both. 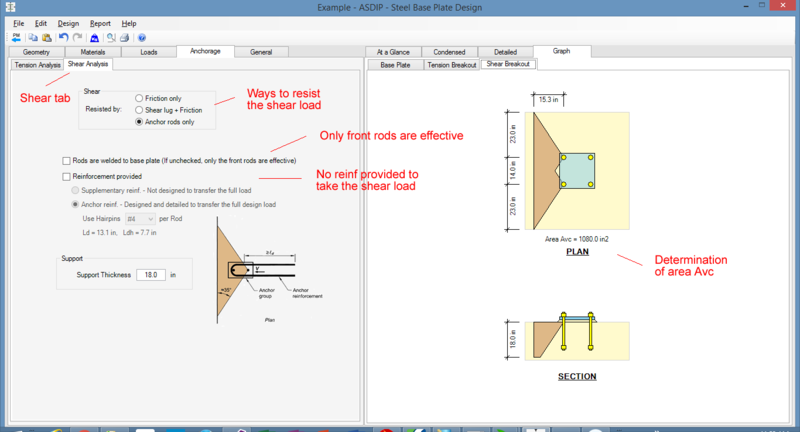 This document is a step-by-step design example of a typical base plate / anchorage using ASDIP STEEL. 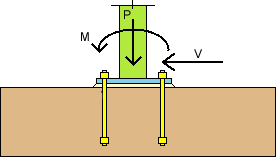 As an example, let’s consider the base plate of a column which is part of a moment frame, subject to the vertical, horizontal, and moment loads shown below. The column rests directly on a spread footing. 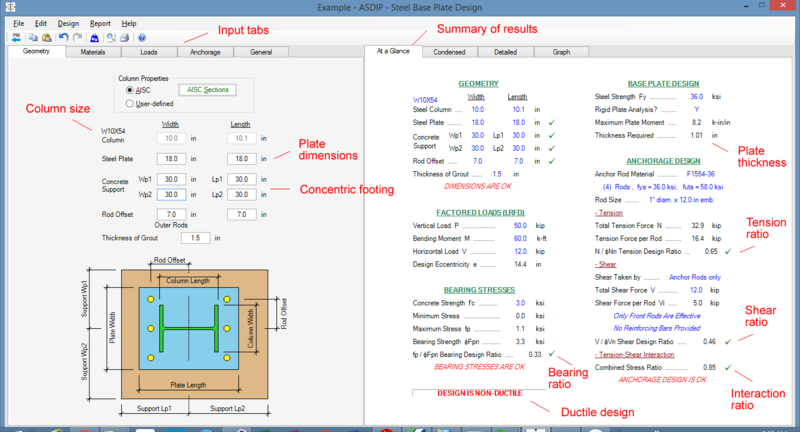 Design the optimum plate dimensions and find the required anchor rods. 1.- Pick the column size from the AISC sections database. Enter the dimensions of the concrete footing. Based on the given column size, enter the plate dimensions leaving enough space for the anchor rods and edge distance. As a rule of thumb, 4d all around the column may suffice, where d is the anchor rod diameter. The image below shows the Geometry tab to the left, and a summary view with the most relevant result information. 2.- Use the Materials tab to enter the footing and plate material properties. Enter the quantity, diameter, and material of anchor rods . The image below shows the Materials tab, and a partial view of the Condensed report with a more detailed information. 3.- Specify the type of loads, either pre-combined or load cases to be combined internally. Select the design method, either ASD or LRFD. Enter the given loads. 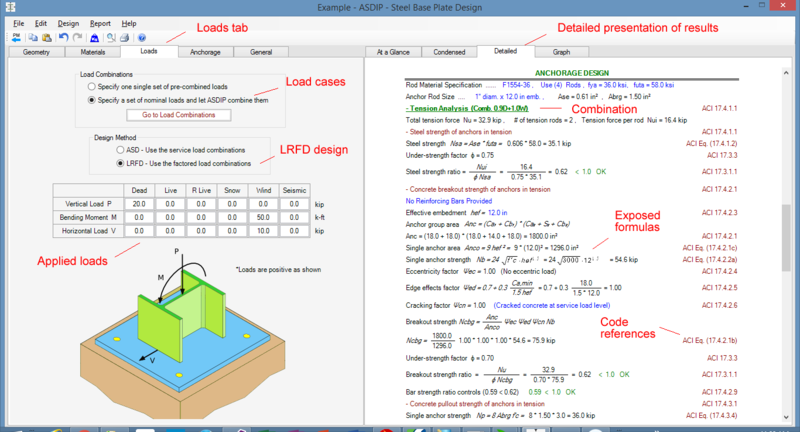 The image below shows the Loads tab, and a partial view the Detailed calculations, showing the exposed formulas and Code references. 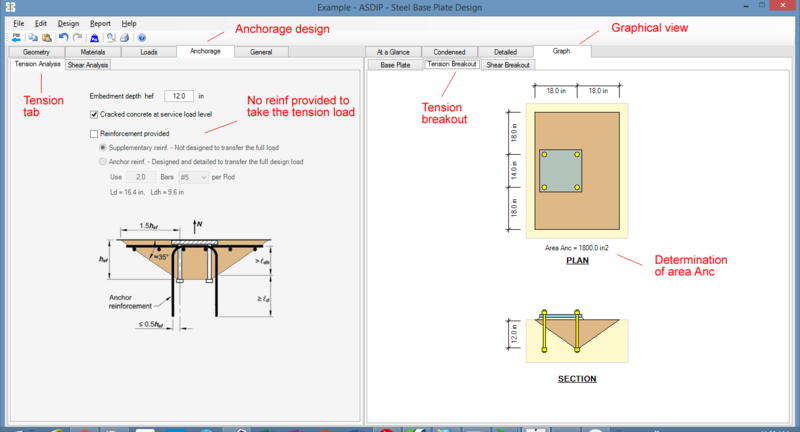 4.- Use the Anchorage tab to specify the tension analysis. Enter the anchor rod embedment depth. Supplementary or anchor reinforcement may be specified. The image below shows the Tension Analysis tab and a graphical view of the tension breakout area Anc. Note that this area may be difficult to calculate by hand for eccentric or narrow footings. 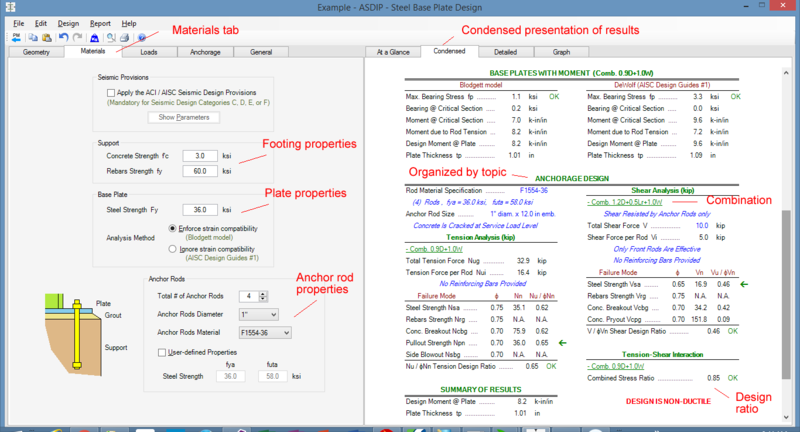 5.- Use the Anchorage tab to specify the shear analysis. Select to resist shear with anchor rods only. Uncheck welding the anchor rods to the base plate. Supplementary or anchor reinforcement may be specified. Enter the footing thickness. The image below shows the Shear Analysis tab and a graphical view of the shear breakout area Avc. Note that this area may be difficult to calculate by hand for eccentric or narrow footings. ASDIP STEEL includes the design of base plates and anchor rods. The design can be completed and optimized within minutes, which otherwise would be cumbersome and time-consuming. Detailed information is available about this structural engineering software by visiting ASDIP STEEL. For engineering background, please see my blog post Anchor Rod Design – The Complex ACI Privisions (Part 1) and (Part 2). Javier, for the support dimensions, wouldn’t it be necessary to provide the dimension of the grout under the plate,(like a short pedestal typically 2″ around base plate), with its F’c. as a secondary check?. The program actually lets you specify the grout under the plate. See the Geometry tab. Typical 28-day strength of commercial grouts is in the range of 6000 psi, so normally the bearing stress in the grout is not an issue.